MORGANTOWN, W.Va. (December 5, 2016) – MX Sports Pro Racing and the ATV Promoters Group (ATVPG) is pleased to announce the FLY Racing ATV Supercross will be returning on Tuesday, March 14, to Daytona International Speedway in Daytona Beach, Florida. Serving as the opening round of the 2017 ProX ATV Motocross National Championship, presented by CST Tires, an AMA National Championship, and a unique non-points paying opportunity for amateur racers, registration is now open for the third annual event. 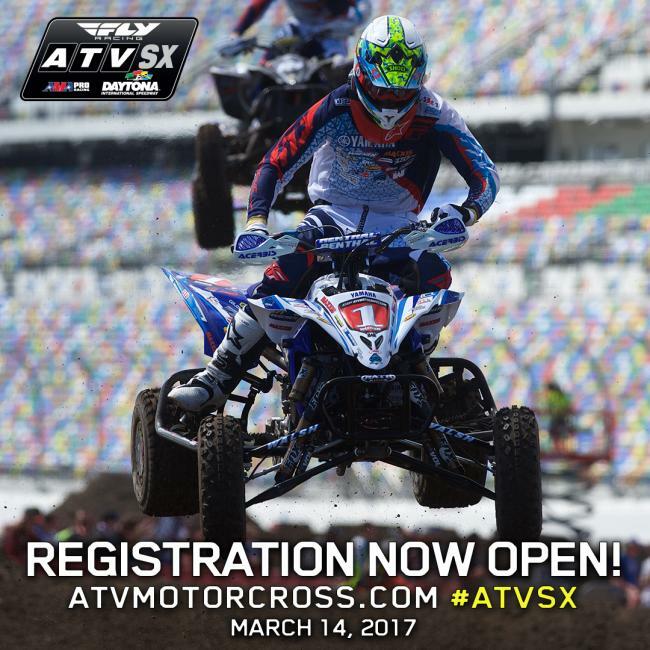 ATVMX will take center stage for its season opener following the opening weekend of “Bike Week” in 2017. 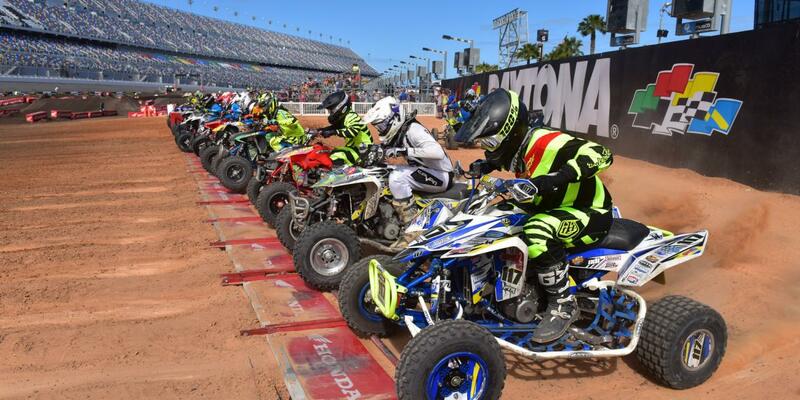 The weekend will feature the renowned Daytona Supercross by Honda on Saturday, March 11, and the popular Ricky Carmichael Daytona Amateur Supercross on Sunday, March 12, and Monday, March 13. The track on the infield of the speedway is legendary for its challenging terrain and demanding nature, and is often considered a challenging hybrid of a motocross and supercross track. Following the format from years past, this event will implement an elimination format that mimics a true supercross style, via heats, an LCQ and main event for the AMA Pro ATV Class, rather than a pair of motos that determines an overall score. Unique from the other rounds of the ATVMX season, Daytona will have a limited class line-up of 17 support classes, including youth, amateur and pro-am classes to accompany the premier AMA Pro ATV Class. However, only the professional competition will account for points towards the championship. To reserve your gate position for the 2017 ATVSX, click HERE. RacerTV.com will also be returning to ATVSX on March 14. The live streaming broadcast will offer race fans from across the world the opportunity to tune in and watch their favorite racers battle for a number one plate. For more information on the 2017 ProX ATV Motocross National Championship, visit the series official website at www.atvmotocross.com. Join the conversation on the series Facebook page, follow on Twitter and Instagram, and be sure to always hashtag #ATVMX. The ProX ATV Motocross National Championship presented by CST Tires, sanctioned by AMA and AMA Pro Racing, is the nation's premier amateur and professional ATV motocross series, hosted at top motocross facilities nationwide. The 11-round series features the Nation's best racers, teams and sponsors, and is America's largest and longest-running ATV national motocross program. Since 1985, the series continues to expand and produce top talent from the amateur ranks, while premiering the professional class. For more information, visit www.atvmotocross.com.